Can you believe it?! Can you believe that a country as previously dominated and ruled through the fear of God, a place run by priests and nuns, a land governed by Catholic law has made history and has taken a stand?? To say I'm proud is an understatement. We don't have to vote in Ireland, and in general the youth don't vote. The "missing generation" in Australia, Canada, The US or wherever we have travelled were unable to vote from abroad. There are no words to describe the feeling I was experiencing reading the #hometovote Tweets on Twitter of Irish Citizens travelling back to the homeland to make their choice heard. 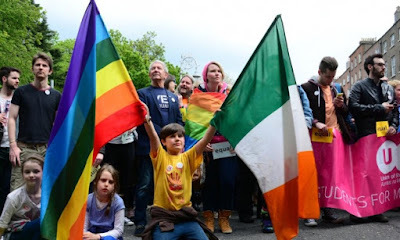 I was in tears reading the blogs and Facebook updates of those who came out or of those who were asking their grandparents to #VoteYes for them. To some, it may not sound like that much, but to anyone who knows what Irish generations are like, how ingrained the opinions and beliefs of the older Irish people are; this was a milestone as great as any Peace Treaty. To know that most of the older generations were going out to vote "No" wasn't a surprise, and despite being extremely frustrating, it was also understandable. Their time was a time when "nobody was gay". Their time was one where you did what the Church said without question, where Ireland was full of Irish people and nobody else, where the South was Catholic and nothing else. They didn't grow up with gay friends, and their children didn't "come out". They were taught that it was wrong and by a source they were told to obey and trust. Some voted "No" out of ignorance, some out of fear and yes, some because they believed it was correct to do so - and that is their right. However, to see some vote "Yes" in their local constituency, for their grandchildren, is something that will stay with me forever as a symbol of how far we have come as a nation. That is love. That is strength. Waiting for the result of the referendum was painful. To know that I couldn't be a part of something so big for my country was difficult to take. On May 22nd 2015 the referendum was approved and Ireland shot into the history books and all over world news and social media as word spread of our decision. Waking up and seeing on Facebook that "Vote Yes" had won was amazing. I am always proud of where I have come from, but on this day I couldn't have been more proud to be Irish. Ireland only got divorce legalised in 1996 and up until 1993 it was illegal to be gay in Ireland. Now, only 22 years later, Ireland made global history by becoming the first country to legalise gay marriage on a national level by popular vote. So, perhaps were were behind with technology, maybe we were behind the times with fashion, yes our banks and government are to blame for putting the country into recession; but the Irish PEOPLE have spoken, and we are so very far ahead of everyone with what actually matters, who is the laughing stock now?